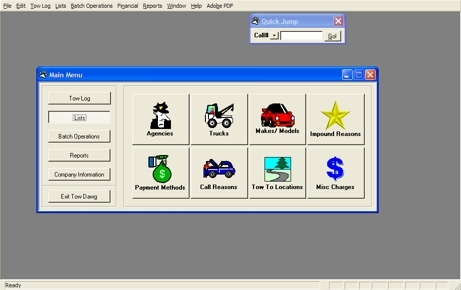 The Tow Dawg software model allows our software to be highly automated while adapting to your business. Lists are the heart and soul of Tow Dawg. By setting up your items, Tow Dawg can respond to the needs of each individual tow. 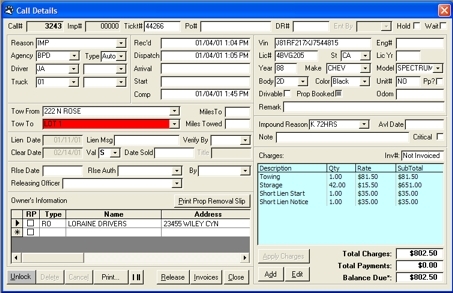 80+ reports to print all types of details about your operation. There is also the ability to customize and hide reports. Details of the tow. In one easy to read screen, see all information related to an individual call. 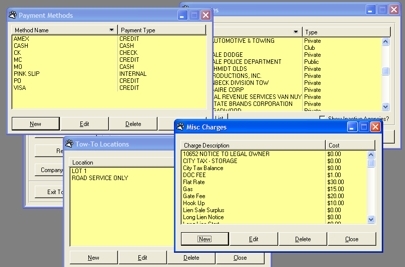 Search - Highly flexible screen for finding tows on varied information or generating list of vehicles. New Call - Input new tows. 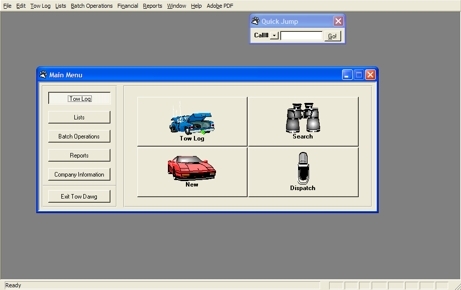 Dispatch - Manage new calls and drivers on a "live" basis. Batch operations take the pain out of managing large amounts of data. With a single click of the mouse, you can accurately process many records very quickly. Set up your company, security, employees, as well as do back ups and maintenance of the software.